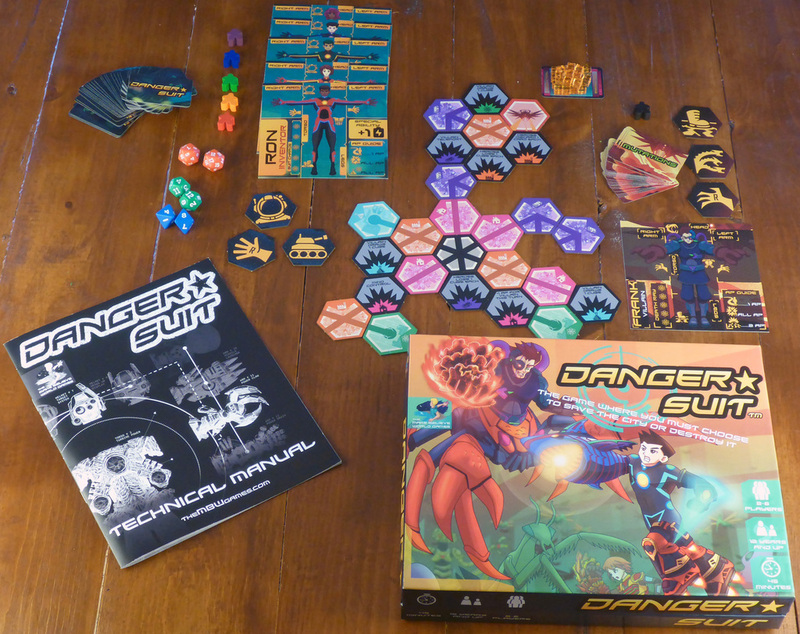 Danger Suit is a game by Matt Peterson, published by The Make Believe World Games and available from The Gamecrafter LLC. It is for 2-6 players. In this game, players take on the role of villain or hero in a 1 vs. up to 5 game of strategy. The players were once all scientists working together for the betterment of mankind until the villain went rogue and ran off with some high tech gadgetry. He’ll be trying to power up his death ray to destroy the city. Meanwhile, the heroes are tasked with trying to stop him as they must construct an improvised Danger Suit from whatever spare parts they can find in their lab. In the end, it’s all about energy. If the heroes can collect enough energy before the villain destroys the city, they’ll be declared the winners. If not, they’ll watch as the city burns and the villain reigns victorious. To begin, players choose one of the character mats. One player must choose the villain mat. The heroes receive the corresponding colored hero token. The villain player is then given their fortress tile. If only 1 hero is playing, all the event cards are removed from the Danger Suit deck. If there are fewer than 4 players, all the event cards with the Channel 4 Heroes logo on them are removed. The Danger Suit deck is then shuffled. The Mutations are shuffled in a separate deck. Both decks are then placed on the table face down. Five energy cubes are set aside for each hero player. These cubes are then placed on the Energy Pool card which is placed on the table. The remaining cubes are returned to the box. The city is then built beginning with the City Center tile. The other city tiles are all mixed together in a face up pile. The villain player starts by choosing one of the tiles and placing it next to the City Center tile. The heroes then choose a tile and place it next to one of the already built tiles. The roads on the tile must connect to the other roads without making any dead ends. Tiles are placed alternating back and forth between villain and hero, each placing 1 tile per team until all the tiles have been placed. Heroes will then place their token onto any unoccupied city tile beginning with the player to the villain’s left. Once all the heroes have placed their token, the villain places their Fortress tile adjacent to any city tile they chose. He then places his villain token onto the Fortress tile. The villain draws 3 cards from the mutations deck, placing them in the corresponding mutation areas on their villain mat. Play now begins. Beginning with the player to the Villain player’s left, each hero will take a turn consisting of 2 Action Points(AP). Once all the heroes have taken their turns, the villain player takes his turn. On a player’s turn, either hero or villain, they may use their 2 AP to perform different actions. Heroes may move to an adjacent tile, attack the villain or move onto a lab or power station. Moving to an adjacent tile costs 1 AP. The heroes do not have to follow the roads but can not move onto or across the Fortress tile. Attacking the villain takes all the heroes remaining AP. No more actions are allowed after attacking however. This means that if the attack is taken first, it will cost 2 AP. However if a move is taken prior to the attack, it only costs 1 AP. We’ll discuss combat in just a bit. Moving onto a lab or power station is the exact same way. If the move is taken first, it costs 2 AP. However if an adjacent move is performed prior to the move onto a lab or power station, it only costs 1 AP. Labs and Power Stations provide special effects for the hero that moves onto the tile. Labs allow the player to draw 3 Danger Suit cards. They are then allowed to play or discard each card as it’s drawn. Event and CDF cards must be played immediately. I’ll discuss these in a moment. It should be noted that each Danger Suit card may be placed on the appropriate spot on the player’s mat. These cards may provide a bevy of different combat dice or increase the player’s battery capacity. Power stations allow the player to place energy cubes onto their player mat equal to their battery capacity. Each player may only hold up to 5 energy cubes, regardless. Once the hero players have taken their turn, it’s the Villain’s turn. For the Villain, he may move, attack or destroy a city tile with his 2 AP. The Villain can move to any adjacent tile without following the roads and can walk on the Fortress tile for 1 AP. Attacking a hero is the same as with the heroes, it cost all the villain’s remaining AP of can only cost 1 AP if a move action is taken first. Destroying a city tile cost 2 AP and allows the villain to destroy a tile, even if there’s a hero on it. However the City Center and Villain’s Fortress tile can not be destroyed. When a tile is destroyed, it is flipped over and the written effect on the bottom of the tile takes effect. The villain then draws 3 mutation cards and plays them as drawn. Mutation cards are a lot like Danger Suit cards and are played on the appropriate spot of the Villain’s player mat. These cards can provide both attack and defense as well as providing minions to be used in battle. Speaking of battle, let me explain how combat works. Combat follows 5 steps. First the battling hero and villain choose a Danger Suit piece/Mutation secretly. This will be what they will use during combat. They also add any CDF and Minions available. Players then place the attack tile with the matching card icon face up in front of them once both players are ready. Both players then reveal their chosen parts by revealing their attack tile. The hero then rolls the die/dice that match their chosen Danger Suit card, adding in any special abilities. Removing any die/dice that the villain’s mutation blocks. Finally the winner of the combat is determined. Players check the total of the die/dice roll. If the total is higher than the villain’s defense, the hero wins. If it’s less, the villain wins. If it’s equal to the defense, the battle is a draw. The loser of the battle then gives the winner 1 energy cube from their collection. If they have no energy cube to give, they are defeated and must discard their entire Danger Suit/Mutations. Minions and CDF cards are not discarded. The game continues until one of two things happens. If the heroes collect all the energy cubes before the Villain destroys the city, the heroes win. If the villain is able to collect 5 energy cubes and return to their fortress with a fully charged death ray or if he can destroy all 6 of 2 specific city tile types, the villain wins. This game has some really great looking pieces to it. First off there are the different hero and villain mats. These are double sided and have a nice finish to them. They’re a little thin but they appear to be pretty durable thanks to the materials they’re made from. There are lots of different cards both for the heroes as well as the villain. These are smaller, more like the Euro sized cards. They look really great as well with a great finish to them also. The artwork for both the cards and mats are really great and work well with each other, especially since you’ll be playing the different pieces and mutations to these mats. The city tiles and attack tiles aren’t quite as nice artistically as the cards and mats but are still great quality. The city tiles look more like something from a crayola colored blueprint. They’re not bad looking, they just don’t capture the same feel that the mats and cards do. The game also comes with several different colored wooden meeples to represent the heroes and villain. These are pretty much your standard meeples. Nothing elaborate about them. Again, not bad but I think some plastic pieces with stickers or even some little cardboard standees would have looked better. This isn’t a major thing but simply a minor gripe. The game has some plastic cubes as well as some colored dice. These are your standard cubes and dice that you can find in many different games or RPG player’s dice bag. Overall, I like the art style on most of the pieces but think that a little more work needs to be done to make the game feel more cohesive. For now, it’s good but could become great fairly easily. The rulebook for this game is pretty good. It’s only 10 pages long and has lots of pictures throughout the book. All the different card types, tiles and mats are explained fairly well. That said, the book is a bit haphazard. Thankfully it’s not that big so looking things up while playing isn’t that big of a deal. It just might take a minute or two to find what you’re looking for. There is some bold text and red lettering here and there but I don’t feel as if it was used well enough to distinguish between some concepts. Don’t get me wrong, it’s not bad. It’s just a little bit difficult to use as a reference. Reading through you get a pretty good feel for the game and shouldn’t have a lot of difficulty with the actual gameplay. Overall, it gets the job done. This is a fairly unique and interesting game. It’s definitely different than most of the games that I’ve played. In some ways it reminds me of the old Japanese team robot animes from back when. For the heroes the game is all about building up your suit to be able to take on the villain and denying him those precious energy cubes. The villain player on the other hand has 2 ways of achieving victory and can turn his attention to what suits his play style the best or whichever path seems to be easier at the moment. I really like how the game really allows the players to customize their character to make them the best they can possibly be. I like how the different components allow the players to amp up their abilities throughout the game. I also really like the variability of the board setup. Each time you play you’ll end up with a completely different board based on the choices that the players make when placing tiles. I also like that each hero player board has special abilities that are unique to just them so that it matters which hero you choose. Normally all the player mats would be the same without any changes. I like that the designer decided to change that and put a bit of flavor to each one. I really think this one works well at what it tried to achieve. Fans of anime or shows like the Power Rangers or other such should enjoy the battling and customizing aspects of this game. This is one that I’d recommend checking out. Overall, I’m really intrigued by the game and enjoy it rather well. 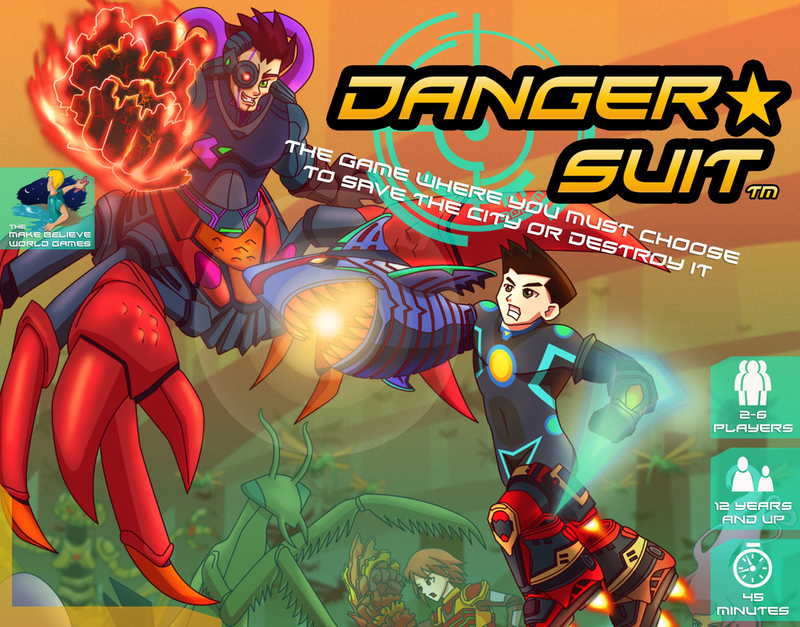 Danger Suit is a 1 versus many game of action selection and battling with a superhero style theme. The game isn’t very long. Most game sessions can be played in around 45 minutes to an hour. Of course with more players it might take a bit longer. The game looks really great. I especially like the artwork on the cards and mats. I feel that these aspects work really great together. The tiles and other pieces feel a bit disconnected however and leave me wanting a bit more cohesion. The rulebook is also a bit rough and could use a bit more polish. Those few minor squabbles aside, the game is quite enjoyable. I like that players will be able to customize their characters throughout the game to become a lean mean fighting machine. I enjoy the 1 versus many aspect of the game but really wish there was a way to make this cooperative against a non player villain as well. In any event, I think the game works quite well in accomplishing what the designer set out to achieve. It has a great feel to it and is one that I will enjoy coming back to many more times. Fans of anime or stylized fighting shows like the Power Rangers should really enjoy this one. I would definitely recommend checking this one out. No fancy one piece suit or Zords needed. For more information about this game, please check out The Make Believe World Games at their site, or you can purchase the game from The Gamecrafter LLC.